She’s not sorry for sending this email. Tami Reiss has a New Year’s resolution, and Gmail will help her keep it. 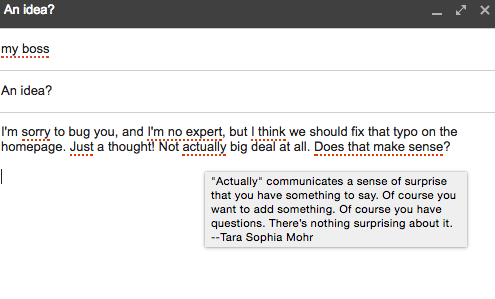 With her company’s new Chrome browser extension, Reiss has put a bull’s-eye on the tempering words and phrases—just, I think, sorry—that clutter up her emails, undermine her authority, and dilute her leadership capacity. Before midnight on New Year’s Eve, Reiss wants to get 10,000 other women to pledge to ban these words from their emails, too. The tendency to pad opinions, ideas, or questions in dampening phrases is so common among women in workplace communications that it’s become a ripe subject for parody by both writer Alexandra Petri and comedian Amy Schumer. Still, part of me always cringes when people tell women that the way they speak or write is wrong. One reason why women have adopted these kinds of speech and writing patterns is because, historically, they’ve gotten pushback for appearing too decisive and demanding (read: just as decisive and demanding as men). Making fun of the way women speak, when they’ve been socialized for a lifetime to take up as little physical, temporal, and aural space as possible, is not productive and can further erode their self-confidence. “One of the biggest things we advocate for is kaizen, which is a Japanese process of small incremental change that leads to bigger impact,” Reiss says. She believes both women and men need to sharpen their self-awareness to address workplace bias. Men who currently occupy leadership positions didn’t often grow up with role models who qualified their statements with “just” and “I’m sorry,” so they need to recognize that they may subconsciously dismiss those who do. And women, Reiss says, need to acknowledge that bias against this kind of language will hamper their chances of success if they don’t present themselves with confidence. This app relieves women of a bit of the sizable burden of realigning their subconscious word choices though the hover-over explanations could be tweaked to read as more encouraging than blame-y. Reiss says she and her staff, who’ve been using the app for a few weeks now, have already become more mindful of their language patterns, even in texts and verbal communication. Since last night, 5,000 people have downloaded the Just Not Sorry extension, and 2,000 have signed the New Year’s resolution pledge. Cyrus Innovation has stored the app’s open-source code on GitHub, urging users to modify the extension with more words and phrases they’d like to highlight or use the code as a jumping-off point for other communication tools. If I could maybe trouble willing coders for just a minute, here’s a completely optional, uninformed suggestion: a complementary browser extension for men that inserts extraneous instances of “just” and “sorry” into their emails as a privilege tax or equalizing measure. Just a thought.